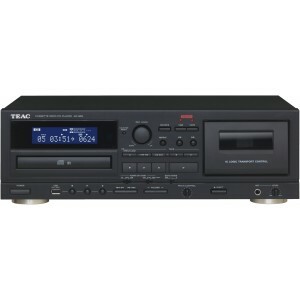 TEAC AD-850 is a combined cassette deck and CD player capable of recording to USB flash drives, it includes a microphone jack with an echo function that can be used for karaoke. A cassette deck and CD player in a single unit, this combined model also supports recording and playback with USB flash drives for a total of three types of media. The built-in mic input jack also allows you to enjoy karaoke using backing music playing from a CD, cassette or USB flash drive. A variety of recording combinations are supported, including recording from a cassette tape, CD, external input or mic input to a USB flash drive (MP3 file) as well as recording from a CD, USB flash drive (MP3 file), mic input or external input to a cassette tape. Recorded files will be saved to automatically generated folders according to the source (CD, LINE or TAPE) on USB flash drives enabling easy digital to analogue conversion without a computer. A mic input jack is built into the front of the unit. You can record a connected mic by itself or mix in the mic signal when playing back and recording CDs, cassettes and USB flash drives. Echo can be added to the sound from the mic connected to this unit. The front panel switch can be used to set the effect to two levels or turn it off. With the AD-850 and a mic, you can easily enjoy karaoke. In addition to audio CDs, the CD player can play CD-R/RW discs containing MP3 files. During MP3 playback, information including ID3 tags and file names is shown. Various playback modes include program, shuffle and repeat (one track, all tracks or program). Various playback modes include programmed, repeat and shuffle playback from CDs and USB flash drives. This cassette mechanism is a two-head single one-way type and supports cassette tapes in normal, chrome and metal positions. Key functions including pitch control playback (±10% adjustment range) are offered.